Born and raised in Hanoi, Vietnam. 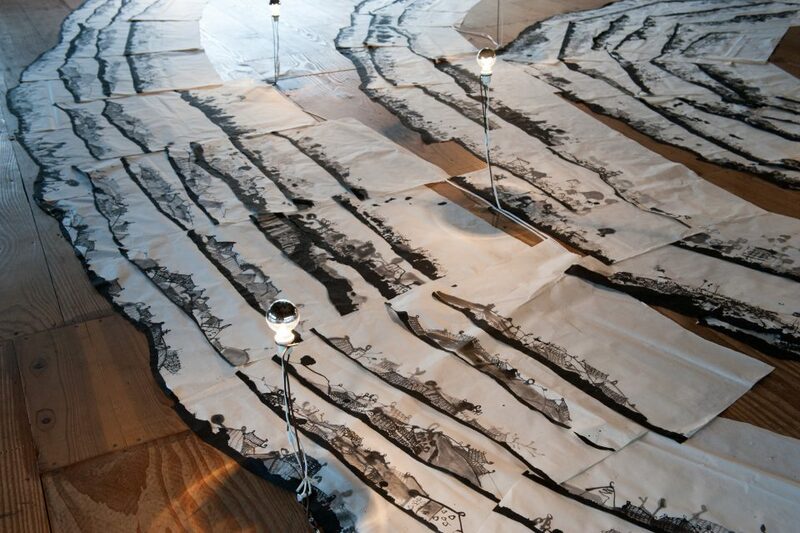 Thu Kim Vu is interested in works that was created from black and white doodle ink drawing on rice paper. 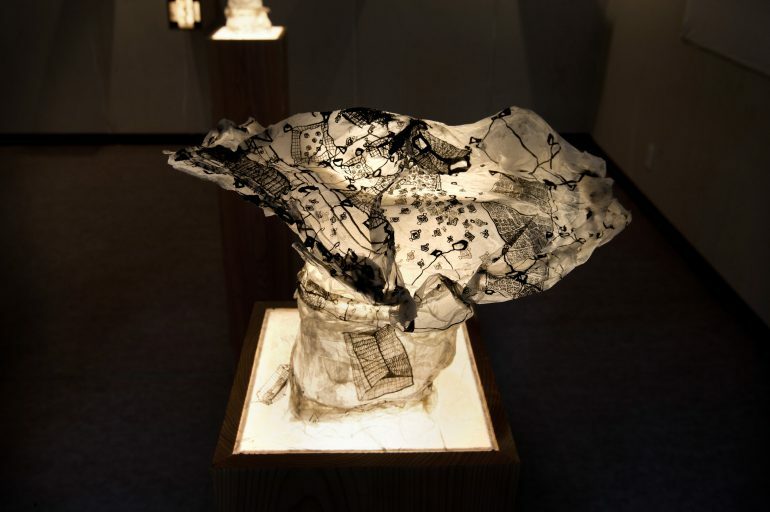 Picking a traditional material used for calligraphy and traditional paintings, she found its flexibility in presenting itself beyond two dimensional forms, its lightness to fold and unfold in variety of spaces and speeding up her ideas. 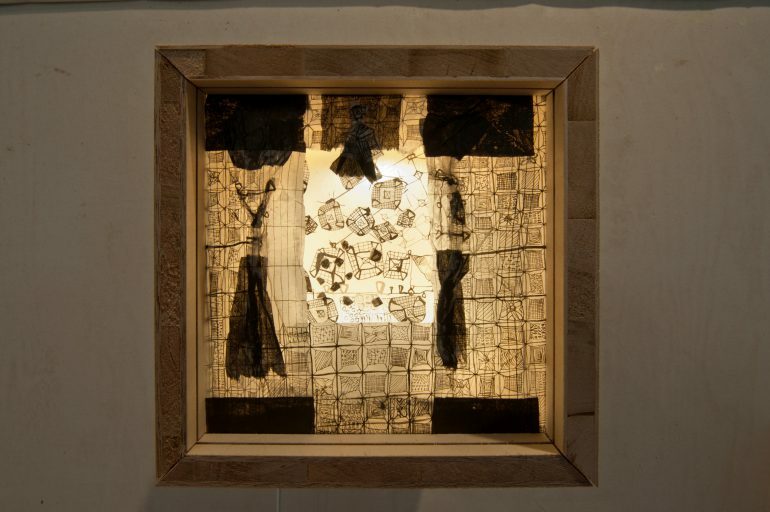 Travelling has been the main inspirational material for Thu’s works in the past years. 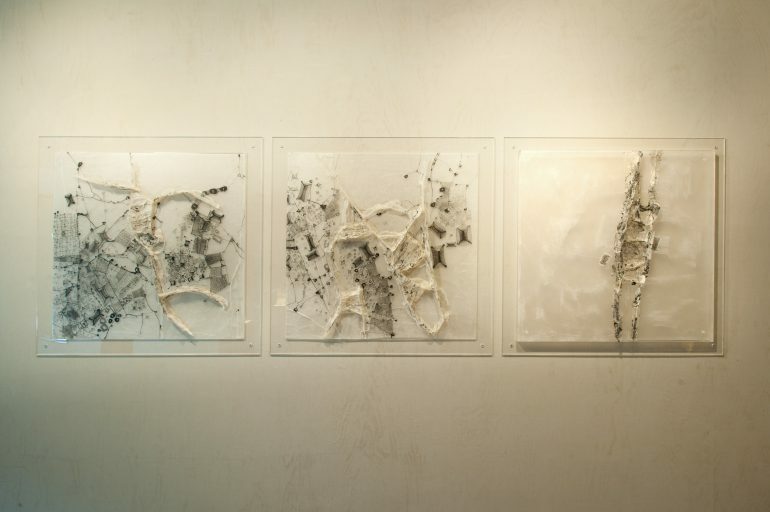 She is currently working with a project focused on map where she navigates each new city she travels through and its facilities by synthesizing its repeated forms, fragmentations, and architectural spaces through memory and observation. The layout of maps generates structures and orientation that she fills with linear details evoking streets, population, traffic, and architecture. Before coming to Japan, my original plan to do in Kamiyama was working with drawing reflecting map of the local area using sumi on washi. As I arrive and live in Kamiyama, my interest in space has grown from the mapping concept into interaction with two spaces. It reflected my relationship with the environment in the area: I feel small in the natural landscape surrounded by the mountains and at the same time feel big in the Japanese tatami houses. Therefore I have chosen two spaces reflects that relationship: The Awa Cafe which brings the feeling of personal cozy home and the Yoriza Theater, a large public space stimulate the feeling of dancing in nature. 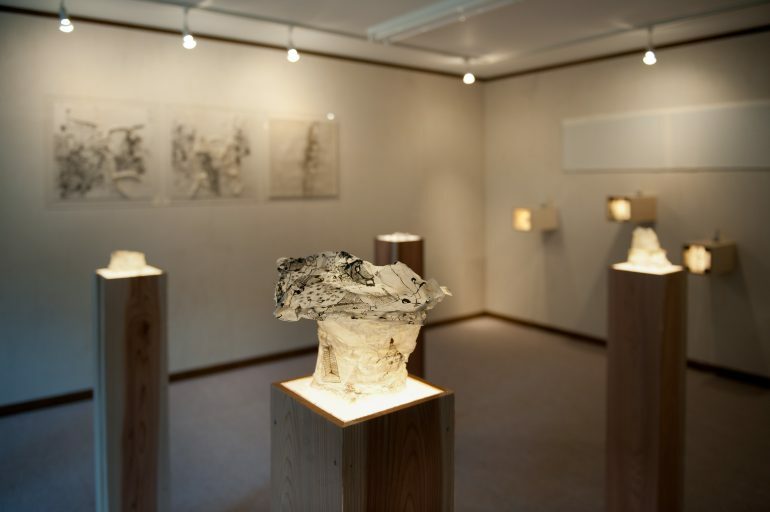 The series of works at Awa Cafe is my experimentation with Washi particularly Gampi paper building up the natural landscape and miniature of interior space boxes. The boxes came from my inspiration of Japanese interior with sliding door combined with the idea of layering screen inspired from the Puppet theatre show here in Tokushima. 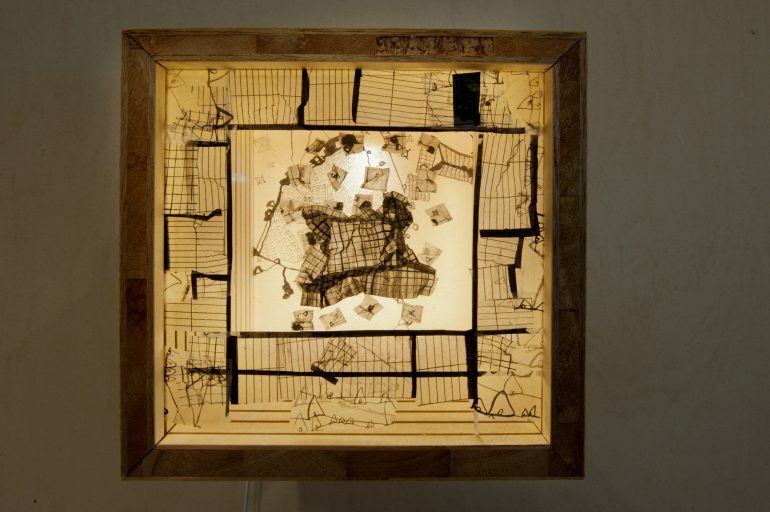 These wooden boxes contain layers of ink drawings that are synthesized in repeated forms and represent fragmentized interior architectural spaces based on my own memory and recent observations in Japan – all of which are illuminated using specialized fixed lights in the interior rear section, or on the outside rear area of each box. 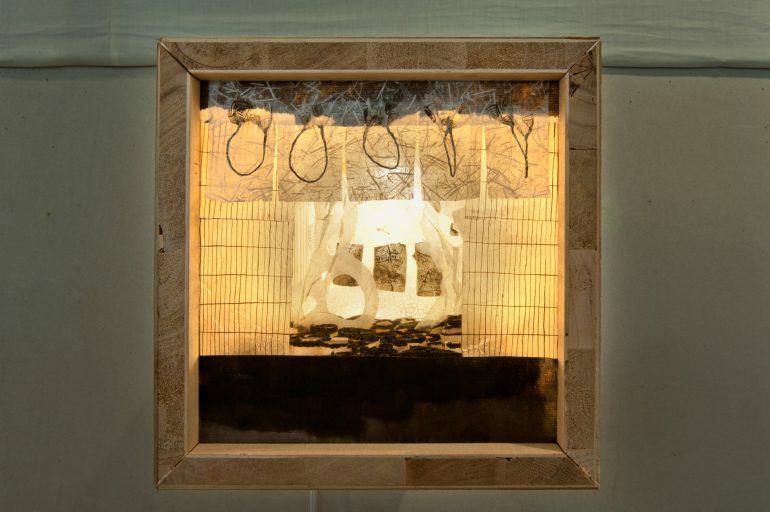 The effect of the lights is modified by the paper and the wooden structure, resulting in an antique tint. 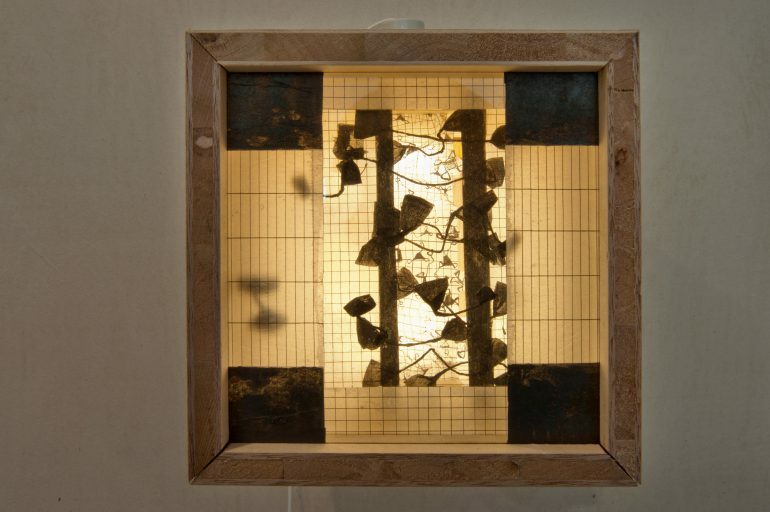 Internally, the boxes are composed of several layers of plexi-glass resemble the Japanese form of sliding doors as well as the idea of transparent visual effects within the miniature space. 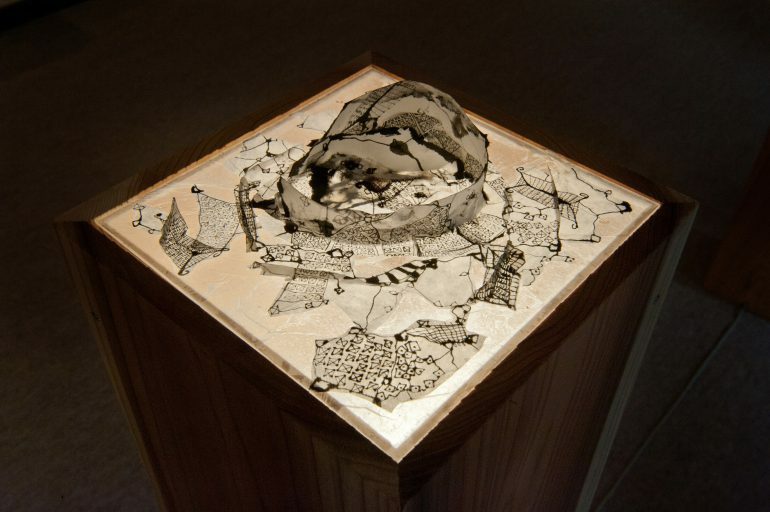 In each box, there is either the reality of furniture and other household objects in miniature form, or as an abstraction of such objects, which leaves viewers to make their own interpretations. 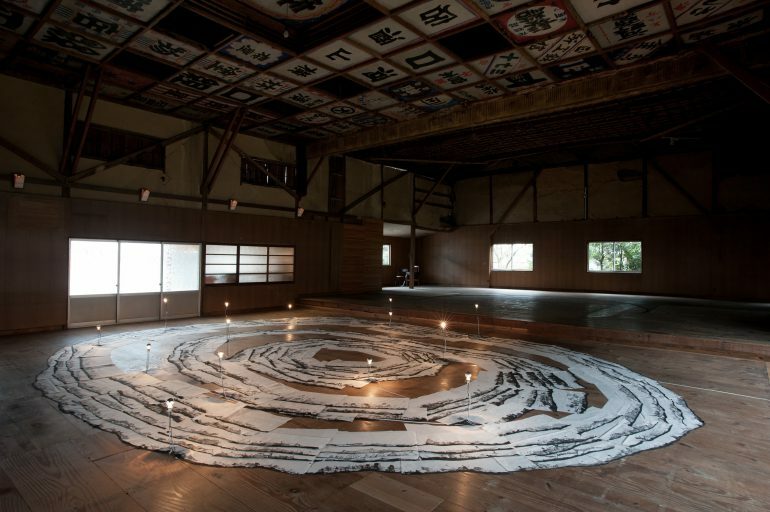 This installation at the Yoriza Theater is the reflection of my experience with Kamiyama landscape of the mountains. Landscape appears in layers with roofs, trees and fields overlapped, forming a circle like construction.